“I have been very vocal since the beginning of June that now is a great time to be adding bonds to portfolios . (See here and here) There are several fundamental reasons for my belief that the recent rise in interest rates was more related to a short term liquidation cycle rather than a shift in global economic sentiment. 2) Four years into the current “recovery” the economy is already past the average length of most growth cycles. Interest rates fall during down cycles. 3) Geopolitical unrest makes U.S. Treasuries an attractive “safe haven” for foreign capital flows. 4) Global economic weakness (China, Euro-zone and Japan) will likely drive buying of U.S. Treasuries. 5) Upcoming “debt ceiling” and budget debate in September likely to drive inflows into the safety of bonds as we saw in 2011. 6) If the Federal Reserve begins to extract liquidity by slowing bond purchases – financial markets are likely to come under selling pressure pushing money flows from equities into bonds. 7) Declining rates of inflation which are representative of economic weakness. 8) Ultra-low interest rate policies by the Fed continue to push investors to seek yield over cash. The recent rise in rates makes bond yields much more attractive. “Germany’s 10-year bonds advanced, snapping two days of declines, as economic reports added to signs the recession in the 17-nation region is deepening. French, Dutch and Austrian securities also gained as European stocks declined, boosting demand for the region’s safer fixed-income assets. Gross domestic product in the euro area fell 0.2 percent in the first quarter, while separate reports showed retail sales in the region fell in April and services shrank last month. The European Central Bank will keep its main interest rateat a record-low 0.5 percent tomorrow, a Bloomberg News survey of economists shows. The 10-year bund yield dropped three basis points, or 0.03 percentage point, to 1.51 percent at 1:28 p.m. London time after climbing to 1.57 percent on June 3, the highest since Feb. 25. The 1.5 percent security maturing in May 2023 rose 0.28, or 2.80 euros per 1,000-euro ($1,309) face amount, to 99.89. Euro-area GDP (EUGNEMUQ) fell 0.2 percent, the European Union’s statistics office in Luxembourg said today, confirming an estimate on May 15. A composite index based on a survey of purchasing managers in services and manufacturing industries in the region was at 47.7 last month, in line with an initial estimate on May 23, London-based Markit Economics said. “Foreigners’ holdings of Australian government securities fell to the lowest proportion of the total in 2 1/2 years, as an improving global outlook damped demand for the safety of the top-rated debt. 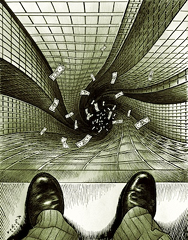 Offshore holdings declined to 68.9 percent of total outstanding debt as of March 31, down from 70 percent three months earlier and the least since the third quarter of 2010, according to government data compiled by Bloomberg. Non-residents owned A$206.4 billion ($200.8 billion) worth of government bonds and bills, down from A$207 billion at the end of the prior quarter. Australian government bonds fell for a second quarter in the three months ended March 31, the first back-to-back declines since the first half of 2009. Foreign holdings of the nation’s debt peaked at a record 77 percent in June 2012, up from 59 five years earlier, boosted by purchases from foreign central banks. Offshore demand for Australian government securities remains strong, with foreign central banks holding notes across the yield curve, Rob Nicholl, head of the Australian Office of Financial Management, said today in Sydney. “Global bond markets posted their biggest monthly losses in nine years in May as the U.S. dollarrallied and stocks reached record highs amid speculation a strengthening U.S. economy will allow the Federal Reserve to reduce its monetary stimulus. The over $40 trillion of bonds in the Bank of America Merrill Lynch Global Broad Market Index fell 1.5 percent on average, led by a 2 percent drop in Treasuries. The MSCI World Index lost 0.3 percent while the Standard & Poor’s 500 reached a record high. The U.S. Dollar Index jumped 2 percent as the greenback gained versus all its major peers. The S&P GSCI Total Return Index of metals, fuels and agricultural products dropped 1.5 percent a month after falling the most since May 2012. Employment gains and increases in housing and consumer confidence suggested the recovery in the U.S. economy, the world’s largest, is gaining momentum, prompting traders to increase bets the Fed will scale back its $85 billion in monthly debt purchases later this year. The Organization for Economic Cooperation and Development predicts faster global economic growth, led by the U.S. and Japan. “It’s been a crazy few weeks in the Treasury bond market. After a big rally that began in mid-March, amid the outbreak of the Cypriot financial crisis and fears over a slowdown in global growth, Treasuries have given up all of their gains, and bond yields are now rising to the highest levels in over a year. This morning, the yield on the 10-year U.S. Treasury hit a high of 2.23%. Naturally, there is a lot of debate over where yields go next. Goldman Sachs, one of the prominent shops calling for higher yields, has published a call saying the sell-off in Treasuries is “for real” this time. Despite hitting a high of 2.23% earlier, yields have since backed down to 2.15%, and bonds are now positive on the day. “……Here’s a 3-year chart of yields on the 10-year Japanese Government Bond (via Bloomberg). “Spanish and Italian bonds led losses among the securities of Europe’s so-called peripheral nations as Chinese manufacturing and euro-area services and factory output all contracted, sapping demand for higher-yielding assets. Spanish five-year note yields rose the most in a month as the nation’s borrowing costs increased at a sale of 4.08 billion euros ($5.26 billion) of government debt maturing in 2016, 2018 and 2026. Italian 10-year yields climbed to a one-week high. Benchmark German bunds advanced as a report showed output in the euro area’s manufacturing and services industries shrank for a 16th month in May. Japan’s Topix index tumbled the most since the aftermath of the March 2011 tsunami. Spain’s 10-year yield rose seven basis points, or 0.07 percentage point, to 4.25 percent at noon London time after reaching 4.27 percent, the most since May 17. The 5.4 percent bond due in January 2023 fell 0.56, or 5.60 euros per 1,000-euro face amount, to 108.965. The rate on Italian 10-year bonds increased eight basis points to 3.99 percent. “At a time when politicians are squeezing budgets to cut borrowing, the bond market is clamoring for more debt, pushing yields on almost $20 trillion of government securities to less than 1 percent. “Treasuries rose, pushing 10-year note yields toward a four-month low, as a decline in stocks and commodities fueled demand for the safest assets. “Germany allotted 3.35 billion euros of 10-year bunds at an average yield of 1.28 percent, thelowest on record, data from the Bundesbank showed. “Shizuoka Bank Ltd. (8355) joined Japanese national lenders in expanding U.S. dollar finance activity, anticipating monetary easing will crush margins on yen loans. The nation’s second-biggest regional bank by market value raised $500 million in zero-coupon notes due 2018, the first public sale of dollar-denominated convertible bonds by a Japanese company since 2002. The average interest rate on long- term yen loans from the country’s lenders fell to 0.942 percent in February, compared with 3.348 percent companies worldwide pay on dollar facilities, according to data compiled by Bloomberg. Mitsubishi UFJ Financial Group Inc. plans to increase energy and utility financing in the U.S., as the Bank of Japan (8301)’s focus on cutting long-term borrowing costs undercuts earnings from yen loans, President Nobuyuki Hirano said. Sumitomo Mitsui (8316) Financial Group Inc. aims to sell a record amount of dollar bonds this year for overseas business, even as the BOJ policy seeks to spur domestic lending to revive the economy. “Italian borrowing costs dropped at an auction of 7.17 billion euros ($9.38 billion) of bonds today as investors shrug off risks tied to the country’s political crisis. Italy sold 4 billion euros of a new 2.25% 2016 bond at 2.29 percent, down from the 2.48 percent on similar maturing debt March 13. Investors bid 1.40 times the amount of the new three- year bond offered, up from 1.28 times last month. The Rome-based treasury also sold longer-term debt, placing 1.67 billion euros of 4.75% 2028 bonds and 1.5 billion euros of floating-rate 2017 bonds to yield respectively 4.68 percent and 2.74 percent. Italy sold a total of 7.17 billion euros of debt, near the 7.5 billion-euro maximum target. “The “fear trade” is alive and well. Investors rediscovered the appeal of haven Treasury bonds on Thursday, amid a flurry of worrying news ranging from North Korea to the domestic job market. The mood change sent Treasury prices rallying to the highest point this year. The yield on the 10-year Treasury note, which moves inversely to prices, fell to its lowest point this year and equal to its closing level at the end of 2012. The moves left buyers of the 10-year Treasury note in the black for the year, a notable swing after the debt spent the entire first quarter in negative territory. “Spanish government bonds rose, pushing two-year note yields to a 2 1/2-year low, as the nation sold more debt than its maximum target at an auction, underscoring demand for higher-yielding euro-region assets. Italian bonds advanced for a fourth day after a report showed the nation’s services sectorcontracted less than economists forecast last month. German 10-year bund yields were about two basis points from the lowest since August after the European Central Bank left its key refinancing rate at 0.75 percent. 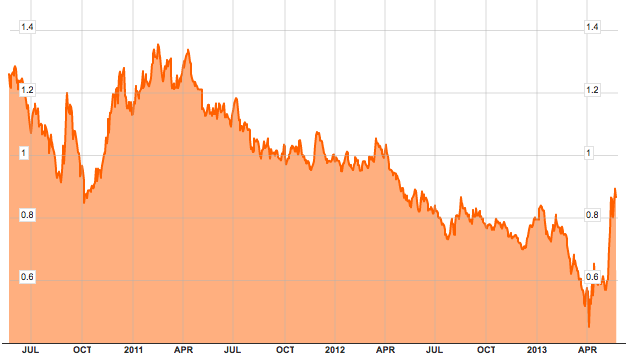 France auctioned 10-year bonds at a record-low yield. Spain’s two-year note yields dropped seven basis points, or 0.07 percentage point, to 2.13 percent at 12:47 p.m. London time, after reaching 2.07 percent, the lowest since October 2010. The 2.75 percent security maturing in March 2015 rose 0.14, or 1.40 euros per 1,000-euro ($1,281) face amount, to 101.19. The Spanish 10-year bond yield declined four basis points to 4.88 percent, while the rate on similar-maturity Italian debt fell eight basis points to 4.51 percent. “Treasury 10-year notes fell for a second quarter, the first back-to-back drop in two years, as investors sought higher-yielding assets amid improved economic data and a Federal Reserve pledge to maintain monetary stimulus. Yields on the benchmark securities reached 11-month highs as the U.S. unemployment rateunexpectedly fell in February and employers added more jobs than forecast. Payrolls also swelled in March, a report next week may show. The rise in yields was tempered as the bailout of Cyprus and political turmoil in Italy renewed the haven appeal of U.S. government debt. “The U.S. economic data was stronger in the first quarter than in the fourth, and it has confirmed the notion that while we are not into a roaring recovery, the U.S. economy seems to be on somewhat better footing,” said Ian Lyngen, a government-bond strategist at CRT Capital Group LLC in Stamford, Connecticut. The U.S. 10-year yield increased nine basis points, or 0.09 percentage point, from January through March to 1.85 percent. It touched 2.08 percent on March 8, the highest since April 5, 2012. The yield climbed 12 basis points from October through December. Its last two-quarter rise ended in March 2011. Ten-year yields fell eight basis points this week in New York, according to Bloomberg Bond Trader prices. For the benchmark yield to rise to a Bloomberg survey’s median year-end estimate of 2.25 percent, “we will have to see the employment market improve, the situation in Europe subside and the end of the Fed’s quantitative-easing program become apparent,” Lyngen said. “Slovenia’s pledge to continue austerity measures failed to stem a rise in bond yields to record highs as investors worry the Alpine nation will follow Cyprus as the next euro-region member requiring a bailout. Prime Minister Alenka Bratusek, in her first major policy speech since taking office, told Parliament yesterday that her week-old government would rebuild ailing banks and improve state finances that are in “bad shape” so the country won’t become the sixth euro member to need aid. European Union officials are striving to contain a debt crisis that prompted Cyprus to joinGreece, Portugal, Ireland and Spain in agreeing on a bailout. Bratusek’s lack of specifics on how to avoid foreign support helped push the country’s benchmark dollar-denominated bonds to an all-time high at a time when Slovenia is looking to tap bond markets. “Developments in Cyprus have translated into concerns that Slovenia will struggle to access the Eurobond market over the coming months as it moves to recapitalize its banking sector and shift reliance for budget financing away from the domestic banking sector, with an increased risk of a haircut in deposits,” Gillian Edgeworth, chief economist at UniCredit SpA (UCG) in London, wrote in a note to clients yesterday. The yield on Slovenia’s dollar-denominated bonds maturing in 2022 rose a record 6.382 percent yesterday and dropped 4 basis points today to 6.34 percent at 9:20 a.m. in Ljubljana, data compiled by Bloomberg show. The cost of protecting Slovenian bonds with credit-default swaps surged 66 basis points today to 384, according to data compiled by Bloomberg. “NEW YORK (MarketWatch) — Treasurys fell on Wednesday, pushing yields higher for the first trading session since the controversial deposit levy was announced as part of Cyprus’s bailout package, as the market looked ahead to the conclusion of the Federal Open Market Committee meeting. Federal Reserve Chairman Ben Bernanke is scheduled to speak in a press conference at 2:30 p.m. Eastern. Yields on the benchmark 10-year U.S. Treasury note 10_YEAR +2.21% rose 4 basis points to 1.95%. Yields move inversely to prices and one basis point is one one-hundredth of a percentage point. Yields on the 30-year bond30_YEAR +1.31% rose 3 basis points to 3.16% and yields on the five-year note5_YEAR +2.68% rose 2 basis points to 0.802%. Uncertainty in Cyprus increased the safe-haven bid for Treasurys as the Cypriot parliament rejected the deposit tax on Tuesday, a requirement for the 10 billion euro bailout. While the rejection of the bailout could lead to a collapse of the Cypriot banking sector and an exit from the euro zone, the European Central Bank said Tuesday it would provide liquidity. “Treasuries advanced for a third day before the Federal Reserve starts a two-day meeting today amid speculation policy makers will decide to keep buying bonds to support economic growth. Benchmark 10-year yields approached the lowest level in almost two weeks as Cyprus’s Defence Minister Fotis Fotiou said parliament may not vote today on a tax on bank depositsneeded to secure financial aid, fueling concern the region’s debt crisis will worsen. Fed Chairman Ben S. Bernanke said this month “premature” interest-rate increases would stifle the economy. The 10-year yield dropped two basis points, or 0.02 percentage point, to 1.93 percent at 7:01 a.m. in New York, according to Bloomberg Bond Trader prices. The 2 percent note due February 2023 rose 7/32, or $2.19 per $1,000 face amount, to 100 5/8. The yield fell to 1.90 percent yesterday, the lowest since March 6. The Fed will issue a statement and economic projections after concluding its two-day policy meeting tomorrow, and Bernanke will brief reporters. “Premature rate increases would carry a high risk of short-circuiting the recovery, possibly leading — ironically enough — to an even longer period of low long-term rates,” Bernanke said in a speech in San Francisco on March 1.